It was during a visit to Cumberland Falls in 1990 when I first read about moonbows. 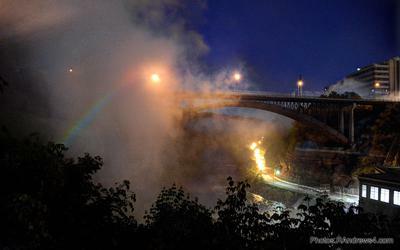 I also learned that the Lower Falls in Rochester, NY where I live is another place were moonbows can be viewed. The Genesee River does not consistently produce enough mist to produce rainbows or moonbows. The water level is low in the summer and the first 1500 cubic feet per second is diverted through the adjacent power plant. After years of trying, I finally captured a moonbow this spring. I couldn’t see it while I was there, but a 30 second time exposure captured a feint rainbow. A bit of tone mapping on the computer enhanced the effect.